Whitewater Canoe Slalom is a competitive sport where the aim is to navigate a canoe or kayak through a course of gates on river rapids in the fastest time possible. Whether you’re an experienced paddler looking for a new club, or a complete beginner wanting to try canoe slalom for the first time, you’ll find us extremely friendly and inclusive – so please do get in touch! VKC has 10 slalom boats for you as members to use to train or race or simply have a go in a different type of boat. 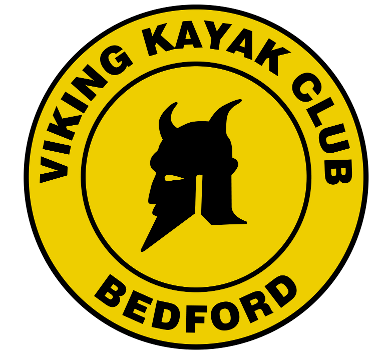 VKC has 3 spots to practice canoe slalom in Bedford. There are about 10 slalom gates set up on lines on the left and right hand channels of the river on the flat water. When Duckmill Sluices (The Jets) are open we get some white water gate work. A few times a year Cardington slalom course in Bedford’s Priory Park is open to the public and for events with the option to put slalom gates on it. Each slalom gate consists of two poles hanging above the river. There are 18- 25 numbered gates in a course and they are either green & white (downstream) or red & white (upstream), indicating the direction they must be negotiated. Upstream gates are placed in an eddy, where the water is flat or moving slightly upstream; the paddler makes the ‘breakout’ and paddles upstream through the gate. Slalom courses can take anything from 80 to 200 seconds to complete depending on the level of competition, difficulty of course, degree of water turbulence and ability of the paddler. Each competitor has two runs on the course and the final result is based either on the faster run. If the competitor’s boat, paddle or body touches either pole of the gate a time penalty of 2 seconds is added. If the competitor misses a gate completely, goes through the gate upside-down, or goes through it in the wrong order, a 50 second penalty is given. Slalom courses are usually on grade 2 to grade 4 white-water. Some courses are technical, containing many rocks. Others are on stretches containing fewer rocks and larger waves and holes.